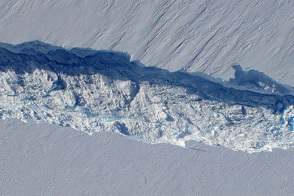 In October 2011, researchers flying in NASA’s Operation IceBridge campaign made the first-ever detailed, airborne measurements of a major iceberg calving event while it was in progress. Four months later, the IceBridge team has mapped the crack in Antarctica’s Pine Island Glacier in a way that allows glaciologists and the rest of us to fly through the icy canyon. 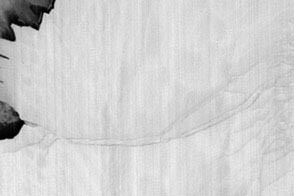 The above image is a still frame captured from a three-dimensional, virtual flight through the new rift in the Pine Island Glacier. (Web and high-definition versions of the movie are linked below the image.) 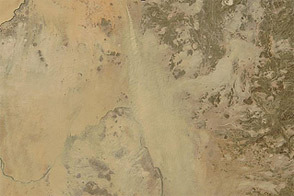 The animation was created from aerial photographs taken on October 26, 2011, by the Digital Mapping System (DMS) on NASA’s DC-8 research airplane. The images from DMS—a still camera with very precise geolocation ability—were put through photogrammetric processing to create a digital elevation model of the landscape. 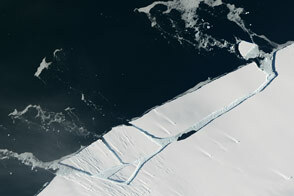 The rift formed in an ice shelf that extends from one of West Antarctica’s fastest-moving glaciers. The flight path of the DC-8 (depicted in this animation) lasted roughly 18 miles (30 kilometers), though the actual crack is longer. The gap had an average width of 240 feet (about 80 meters) and was 820 feet (250 meters) at its widest. The canyon ranged from 165 to 190 feet deep (50 to 60 meters), with the floor being roughly at the water line of the Amundsen Sea. Radar measurements suggested the ice shelf is about 1,640 feet (500 meters) feet thick, with only 165 to 190 feet of that floating above water and the rest submerged. 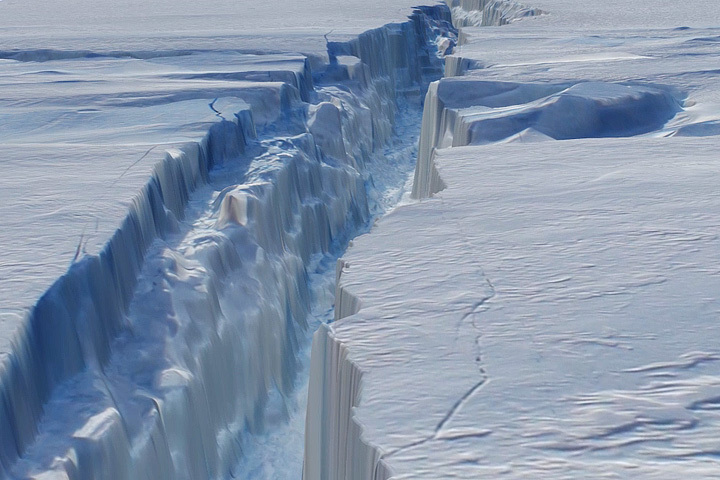 Scientists have been waiting for the crack to propagate through the rest of the ice shelf and release an iceberg, which they estimate could span 300 to 350 square miles (up to 900 square kilometers). 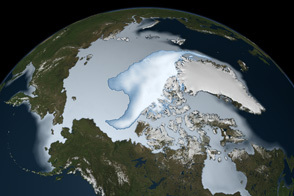 If it does not split off soon, however, the sea ice that forms with the onset of southern winter might keep the ice chunk trapped against the coast for a while. 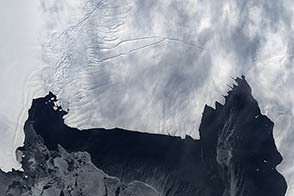 Pine Island Glacier last calved significant icebergs in 2007 and 2001, and some scientists speculated that it was primed to calve again. 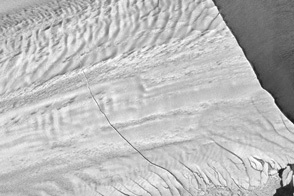 But until the IceBridge flight on October 14, 2011, no one had seen any evidence of the ice shelf beginning to break apart. Since then, a more detailed look back at satellite imagery seems to show the first signs of the crack in early October. Editor's Note: To see more video about Pine Island Glacier, jump over to our blog page. Animation by the NASA IceBridge team. Caption by Mike Carlowicz, with reporting from Patrick Lynch and Jefferson Beck. Scientists merged photographs and laser altimetry data to create a virtual journey through the crack in Antarctica's Pine Island Glacier.